Get ready for the perfect experience for upperclassmen & recent grads. This Birthright Israel adventure for 21-23 year olds is the ideal trip for you! 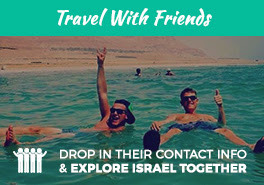 Explore Israel with Israelis as you connect with the sites, sounds, people, culture, & vibes, This summer is YOUR summer & now is the time. What's stopping you? "Going to Israel on #Birthright was the best experience of my entire life. I am truly changed by the friendship I gained from the Israelis on our trip. I would URGE anyone & everyone who can to go with #Shorashim."